why: I just wanna make things. Cosplay and Coffee is the brain-child of a writer turned cosplayer who wanted to do all the things. 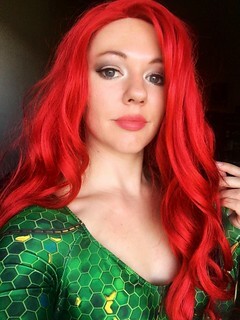 My name is Tiffani and I created the website cosplayandcoffee.com so that I could keep all of you lovely cosplayers and cosplay-lovers up to date with cosplay tips and tricks, cosplayer interviews, and product reviews. However! Over the past year, I have discovered the joy that is YouTubing and have decided to take my endeavors past just the normal website. My YouTube channel shows you what I've been learning as a cosplayer through tutorials and product reviews. Plus, you can watch me hang out with other cosplayers as I get to know some of you! So here we are, on Patreon, the site for the struggling artist. Your support on Patreon will help me take the time to put together more cosplay tutorials for you. Tutorials take so much time to make, and in order to do this consistently and professionally, it will literally have to be my full-time job. So, my goal is to eventually be a full-time content creator. For me, that means making YouTube stuff such as tutorials, interviews, and product reviews. It also means creating monthly cosplay eBooks! - I can gather enough materials needed to make these cosplays and stay on budget. - I can make consistent YouTube videos for your entertainment! - With your support, I can take my time to ensure my elaborate builds are done precisely and ensure my tutorials are professional and easy for you to follow! -Most importantly: the ability to (eventually) be a full-time creator and writer! Your support means everything to me, especially if that means I can bring you better and more consistent cosplays and tutorials. Whether it's helping me create new cosplays or gathering products to review for your reference, I will appreciate the heck out of it. This includes WIP and video bloopers! You’ll be the first to know what smaller cosplays I’m working on, see Work In Progress photos from my current build, and what YouTube videos are coming this week! Did you miss something this month? I’ll send you one email a month of all the content I put on Youtube, CosplayandCoffee.com, and cosplays from my social media. There will also be info on cosplay product sales, discount codes, cosplayer interviews, and more! These will be written details of the tactics I use for my website, YouTube videos, marketing, etc! I will be working on a brand-new cosplay armor build every Quarter for 2019! These videos will be one-minute tutorials on something I have learned while making these builds. It can be anything from EVA cutting to painting techniques to construction methods. *Cosplay build characters will be announced at the beginning of every quarter! *NEW! I will also ADD your name to a portion of my cosplay! Once I reach this goal, my first quarter cosplay build for 2019 will be fully funded and I can start working on the video tutorial and eBook!